All tenants have a right to due process. As such, the law requires that certain criteria be met in order for a landlord to legally evict a tenant from their property. These criteria vary depending on the type of tenancy a resident holds, and failure to comply with any may be grounds to resist eviction. In most cases involving a tenancy in the private sector, a landlord will not be able to evict a tenant without having first served a valid Section 21 notice or a valid Section 8 notice. The former is a “no fault” possession notice which can only be served in respect of assured shorthold tenancies. Here, a landlord is not obliged to provide a reason for wanting to take back the property. The latter, on the other hand, is a notice to quit which allows the landlord to seek possession of the property if the tenant has breached the terms of their tenancy agreement. All assured shorthold tenants are entitled to remain in the property until the landlord has obtained a court order for possession (although this will often involve the payment of some of your landlord legal fees in doing so). If you have a defence to the proceedings, you will need to notify the court as soon as you receive the claim form. Once a possession order is granted by the court, an eviction can only be carried out by court appointed bailiffs. The information below only relates to the most common type of tenancy, an assured shorthold. If you live with your landlord, reside in social housing, have held a tenancy for very long time or you are the resident of a “guardianship” property, the procedure for eviction may be very different and you should seek advice in relation to your status. What constitutes a valid Section 21 notice? What is the notice period following a valid Section 21 notice? You are entitled to at least two months’ notice before having to leave the property. You should use this time to make arrangements for alternative accommodation. Furthermore, your landlord cannot serve you with a valid Section 21 notice within the first four months of the first day of your tenancy. The notice must contain certain information that is prescribed by law. If the notice does not contain the right information, it will be invalid. If you have provided a deposit, you should check that it is protected in a tenancy deposit scheme. If your landlord has not done so, they cannot serve you with a valid Section 21 notice until they return your deposit to you. You may also be entitled to a penalty payment from your landlord. If your tenancy commenced on or after 1 October 2015, your landlord must give you up-to-date copies of your gas safety and energy performance certificates as well as the rent guide produced by the government at the outset of the tenancy. Failure to do so will render the Section 21 notice invalid. In some cases, your landlord can rectify the failure by serving you with the documents before issuing a Section 21 notice. What happens if the property is in disrepair? If you have complained to your landlord in writing about any outstanding disrepair in relation to the property, and the landlord has been served with an improvement notice by the council, they will not be able to serve you with a valid Section 21 notice. If your landlord fails to obtain a license where required (i.e. you live in a house of multiple occupation) they will not be able to evict you using a Section 21 notice. In exceptional circumstances, a court will be able to grant. What constitutes a valid Section 8 notice? Just as the validity of a Section 21 notice depends on the manner in which it was served, so too does the validity of a Section 8 notice. In this case, your landlord must provide rely on one of 14 reasons (grounds) to evict you from the property. If they cannot do so, the court will refuse to make a possession order. They are also obliged to inform you of the earliest date at which they intend to issue court proceedings. All such information must be provided in writing using the appropriate form otherwise it will not constitute a valid Section 8 notice. What is the notice period following a valid Section 8 notice? The notice period that you are entitled to will vary depending on the grounds for seeking possession. In most cases, you will not be required to leave immediately. Your landlord will only be able to issue court proceedings for possession if you have not vacated the property by the date given on your Section 8 notice. 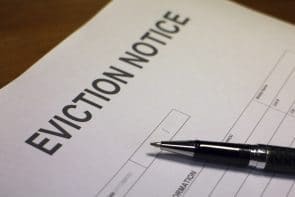 You might be able to challenge your eviction if you can convince the court that you should not have received the section 8 notice, that it was served incorrectly or that there is some other good reason as to why you should not be made to leave the property. In some cases, a judge would be able to allow you to remain in your home if it is considered reasonable (aka a discretionary ground for possession). In other cases, such as where more than 2 months’ rent is owing, the court will not have discretion (mandatory grounds). The notice served to you should explain the reasons for the eviction proceedings. It may be worthwhile talking to your landlord where possible in order to come to an understanding. In the case of rent arrears, for example, this may culminate in an agreement to repay the arrears in small installments over a set period of time. If, however, you are unable to reach an agreement, and you believe that you have strong grounds for remaining in the property, you should consider contacting a solicitor for further advice and guidance. As well as defending possession, you may also be able to counterclaim a Section 8 notice for rent arrears if your landlord has failed to protect your deposit or has neglected to carry out any repairs if they have had reasonable notice in accordance to their legal obligations. Co-author of this blog is Abdurrahman Sufi, a Legal Clerk in the Housing & Property team.